A hemp products business owner and campaigner has called the removal of a cannabis plant from a flower display in Glastonbury, Somerset, as "sad and shocking". The police and Glastonbury Town Council acted after a member of the public alerted authorities, complaining about the plant. It was pulled up from the display shortly after. 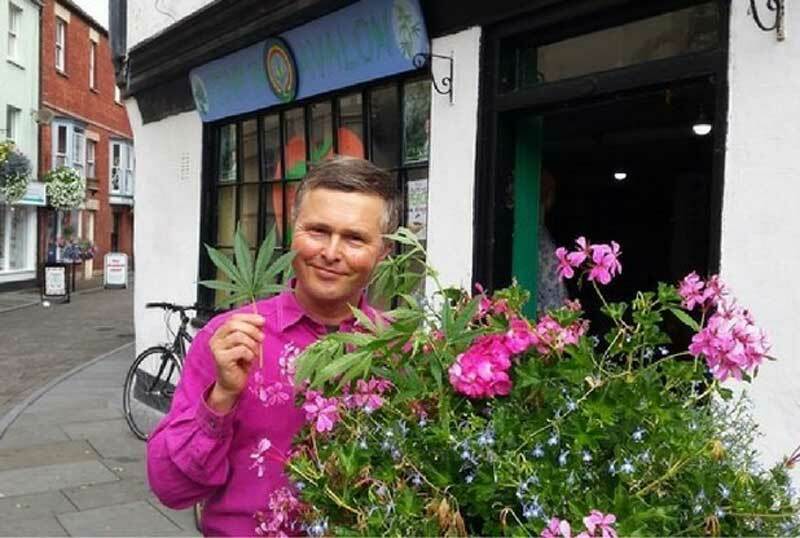 But Free Cannabis, who changed his name from 'Rob' in 1997 by deed poll, who runs Hemp in Avalon near the display on Glastonbury's High Street says the plant has been unofficially part of the displays for 18 years. "I and others come along and drop the seeds into the tubs, they get watered by nature – and the council," said Mr Cannabis, 49. He scooped the Glastonbury in Bloom Award back in 1998 for a display which featured the plant, but ended up falling foul of the law and receiving a 12 month conditional discharge for his actions. He also got into trouble in 1998 trying to hand the then Home Secretary Jack Straw a cannabis plant. Since then he has simply sprinkled a few seeds and left it at that. "I am amazed that people get so excited about this, it's a sad reflection of society's hemp-phobia," he said. "This is a plant that has so many medicinal qualities, it's a food, it's used for fibre and fuel, it basically gives you everything you need." An anonymous poster left a message on a Glastonbury community Facebook page saying they had reported the plant on Tuesday. They posted: "Typical police, reported weed being grown in the plant pot outside Hemp in Avalon – had a phone call saying they were going to look and surprise, surprise, it's still there." In fact, Avon and Somerset Police acted quickly and later that day a council worker removed the plant. PC Stuart Ball, Beat Manager for Glastonbury said: "The small, single plant was removed by the council on Tuesday, having been found in a council-owned basket. Cannabis is a controlled substance and we would take a vigorous approach to anyone found growing it for supply purposes." Town councillor and local member for Mendip District Council Alan Brunsdon added: "They crop up from time to time - they get added to the displays. "We just remove them when we come across them." But Free Cannabis said he doesn't understand the public concern "A lack of hempathy leads to a lack of empathy," he said. "It's insane that a plant that is so beneficial - it's used in the treatment of cancer, MS, arthritis and pain management - is illegal. This is why people end up dealing it illegally and end up becoming criminalised. It's insane when there are no recorded fatalities" Mr Cannabis sells a completely legal, non-mood altering form of hemp for medicinal purposes. He also sells clothes, food and other products from his shop. "My dream is to be out of business - I just want to live in a world in which this plant is honoured and respected and grown freely."